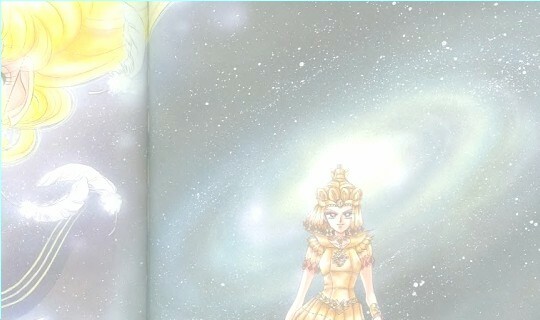 Lita is the tomboy of the Inner Senshi, and the strongest. Lita hates that she's so manly and strives to become a lady like Princess Serenity. Lita didn't make friends right away because Melvin spread a rumor that she got kicked out of her old school for fighting, but being the tallest girl in school and having a gruf look on her face, no one could tell other wise. Lita actually came to CrossRoads because she felt that her destiny lied there. She was right. Lita is also the motherly one of the Senshi, cooking, cleaning, nurturing, gives good advice, and always lends a loving ear. Lita cherishes her friendship with Amy, Raye, Mina, and Serena very much. Lita lost a good friend before she came to CrossRoads and swears that she won't let it happen again. Lita has lived alone since she was eight years old. Her parents dies ina a horrible plane crash, which explains her fear of flying. Lita's parents were wealthy enough that she can live comfortably till she is old enough to get a real job. The location of Lita’s apartment is unknown but I do know that she lives near Mina. Lita wants what most girls want, true love, and she strives to find it. On top of becoming a bride, Lita wants to own a flower and bakery shop(she has a green thumb and can cook really well). Lita sees Michiru and Haruka as her role modles. Michiru is the lady she wants to be, and Haruka possesses the strength she wishes to obtain. Though Lita acts manly a lot, there are some ways you can tell she strives to be a lady. She keeps her hair nice, wears rose earings (rumored to be her mother's last gift to her before she died), and she always smells like perfume. Sailor Jupiter is the third Senshi to be discovered by Sailor Moon. Sailor Jupiter joins the Senshi just as the mission changes from finding the other senshi to finding the princess and the Silver Imperium Crystal, and protecting them both. Jupiter embraces this destiny and this mission proudly. Jupiter’s attacks deal mainly with lighting and energy. Her powers almost rival Mars' but Mars gets more power in my book for having ESP and magic. Jupiter’s attacks also deal with plants. “Flower Hurricane” “Cocoanut Cyclone” are the two that I know right off the top of my head. She killed Nephrite using Flower Hurricane. Because of her extreme losses, Lita hates feeling helpless and weak because she wants and in a way needs to protect her friends. Some times this can interfere with things like studying. Shed cares too much and sometimes people get annoyed with it.